You're watching curling on the Winter Olympics, aren't you? You're saying to yourself: "That looks like fun, how hard can it be?" (The answers: it is a lot of fun, and it's easy to learn but difficult to become a great curler.) Now you can find out for yourself! Our next Learn to Curl session will be held at the Bridgewater Ice Arena on Friday, March 23 from 8:40–11:00. Space is limited and this will sell out, so sign up quickly! The cost is $40 per person (ages 18 & up). 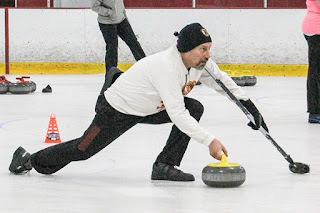 Registration opens on February 15 at noon — visit southshorecurling.com then and click "Learn to Curl in March" to go to the sign up page. ...and if you miss out on this one, we'll try to have more chances for you to try curling as the ice arena and club volunteer time allows!